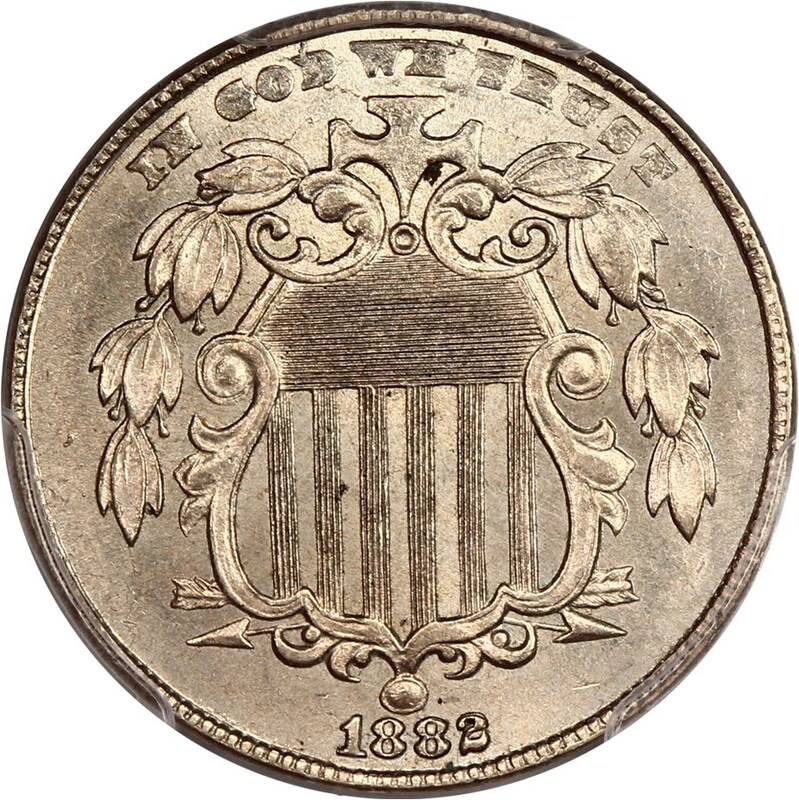 Shield nickels were struck from 1866 through 1883 and designed by James B. Longacre. These 75% copper, 25% nickel coins, the first 5-cent pieces with this composition, circulated concurrently with the physically smaller but equally denominated half dime, which also has a face value of five cents. Generally speaking, the scarcest Shield nickels were minted from 1877 through 1881, with the 1866, 1867 Without Rays, 1868, 1869, and 1882 issues being the most commonly encountered dates across the grading spectrum. The rarest issues by date are the 1877 and 1878 Shield nickels, which are proof-only issues with a combined mintage of less than 3,000 pieces. Shield nickel varieties include the 1867 Rays and 1867 Without Rays, with the former showcasing rays between the stars that encircle the large numeral ?5? on the coin?s reverse. Earlier into production that year, the rays were removed, leaving only stars around the ?5.? Another set of important varieties are found on 1873 nickels with the Closed ?3? and Open ?3,? as evidenced in the fourth numeral of the date. The 1873 Open ?3? is far more common than the 1873 Closed ?3.? All Shield nickels were made at the Philadelphia Mint.